Fire damaged a Coudersport house late Friday afternoon. State Police fire marshal David Surra says the fire at 132 Resse Hollow Road started in the living room because a faulty three-way plug was plugged into an electrical outlet. The house owned by Michael Spong is unoccupied and Surra says no injuries were reported. Some of us here at 1490 WESB were waiting for the day to come -- and it did on Monday. 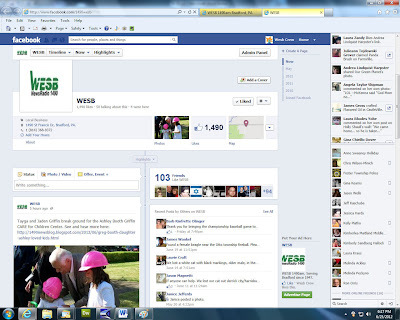 We got our 1,490th "like" on Facebook! A big THANK YOU to everyone who has liked us so far. But we don't want to stop there. If you haven't liked us yet go here and do it. Please? And thank you in advance. The next Facebook milestone we're waiting for? 1,001 likes for The Hero. We're almost there. Like us here. OLEAN – When Sergeant First Class Glenn Treaster stopped by Senator Catharine Young’s office in Olean to inquire about military medals, he had no idea he would be receiving so many awards. “When I learned about the medals, I thought, ‘You’ve got to be kidding.’ To me, this is awesome. I am getting something I didn’t know I had coming. I’m being honored. I’m on top of the world,” Sergeant Treaster said. Senator Young presented Sergeant Treaster with medals during a special ceremony at Central Baptist Church, where he serves as a substitute minister. The awards Sergeant Treaster received for his service, included the United States Army Achievement Medal with Device, New York State Medal for Merit, Air Force Outstanding Unit Award, and Cold War Recognition Certificate. If you’re headed to Canada today, make sure you have plenty of gas in your car for the trip back to the U.S. The Niagara International Transportation Technology Coalition is reporting delays of up to 3 hours for people coming into the United States. The delays on the Peace Bridge and Lewiston-Queenston are 2 to 3 hours. The delays on the Rainbow Bridge are from 1 to 2 hours. The wait to get into Canada could be up to half an hour. 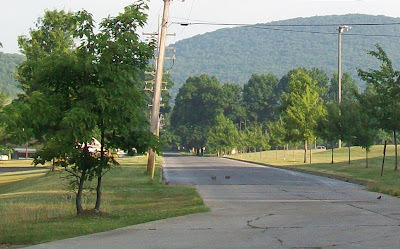 Why Did the Rabbits Cross the Road? To get to the rabbits on the other side, of course. With Independence Day coming up on Wednesday people’s thoughts turn to fireworks and if you’re really in the mood for them now, you’re in luck. There’s a show tonight. At Ellicottville’s Summer Festival of the Arts, which started on Friday, the Buffalo Philharmonic will perform starting at 8 o’clock tonight, and that will be followed by a fireworks display to "The 1812 Overture" and "Stars and Stripes Forever." Fireworks, parades, concerts and baseball games continue through the 4th of July across the region. For a list of all the area celebrations visit our community calendar. Senator Joe Scarnati is one of the people who is not happy with Thursday’s Supreme Court decision on the Affordable Health Care Act. Back in March, the state Senate approved a measure by Scarnati that would amend the state Constitution to prohibit Pennsylvanians from being required to obtain health insurance coverage or from being penalized for not doing so. “It becomes very apparent that our state’s rights and individual rights continue to be trampled, not only in Pennsylvania but across the nation,” he said today of the Supreme Court’s ruling. Scarnati said Senate Bill 10 would give voters an opportunity to say “yes” or “no” to the “individual mandate” provision of the health care act, which says Americans must purchase health insurance by 2014 or face escalating financial penalties as high as 2.5 percent of their total household income. The state Senate today approved a fiscally responsible, sustainable state budget that does not increase taxes and restores funding for education and human service programs, said Senate Appropriations Committee Jake Corman (R-Bellefonte). Senate Bill 1466 fully restores funding for Pennsylvania's state-related universities and State System of Higher Education schools. In return, the presidents of these institutions have agreed to keep tuition increases to a minimum – no higher than the Consumer Price Index. "Restoring funding for higher education is a big win for residents across the Commonwealth," said Corman. "Our public colleges and universities are one of the best resources we have for economic development and job creation. Additionally, state funding helps keep access to high levels of education open for individuals at all income levels." Washington, D.C. – U.S. Representative Glenn ‘GT’ Thompson today voted to support H.R. 4348, a bipartisan House-Senate Highway Bill agreement that reauthorizes federal highway and transportation programs through the end of fiscal year 2014. Thompson on June 14th initiated a bipartisan letter to the House-Senate Highway Bill Conference Committee urging dedicated funding levels for bridges not on federal-aid highways, otherwise known as “off-system bridges,” which was included in the final agreement. H.R. 4348 passed the U.S. House by a vote of 373-52. Some people from Chautauqua County apparently were trying to stock up on snacks for their holiday parties. State police say at 2 a.m. Thursday they were called to a break-in at the Frito-Lay warehouse in Dunkirk. They interviewed a delivery truck driver who witnessed several people leaving the business, and then learned that someone had broken into the building. Their investigation led them to a house where they – quote – recovered proceeds from the break-in. They did not specify what those proceeds were. Police charged 20-year-old Marqus Singh and 17-year-old Stephanie Conklin, both of Fredonia, and 27-year-old Jennifer Melendez-Contreras of Dunkirk, with burglary. They were all sent to jail in lieu of $20,000 cash bail. Can you get Doritos in jail? The National Weather Service in State College says hot and muggy conditions will prevail over the upcoming weekend and into next week, as a weak cold front stalls near the Pennsylvania, Maryland border. Temperatures in this area will be in the mid- to upper 80s through Thursday with only a 20 percent chance of rain. 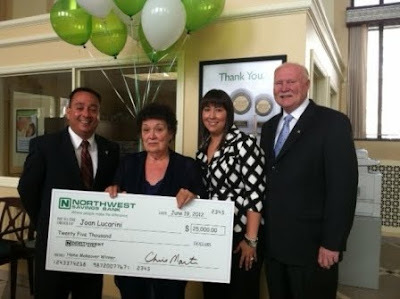 Joan Lucarini of MacDonald, Pennsylvania has won the $25,000 Home Makeover Sweepstakes sponsored by Northwest Savings Bank. The local bank presented her with her award when Amber Castellana, Manager of the Northwest’s MacDonald Office, John Mendel, Manager of the South Hills District of Northwest, and Christopher Martin, President of the Southwest Region of the bank gave her a check for the full amount at the bank’s MacDonald Office on June 26. Read the accompanying story by Scott Detrow at StateImpact.NPR.org. For the second time in a year firefighters were called to a fire at the abandoned Old Johnsonburg Hotel. The first fire was believed to be arson, and so is the one that was reported at about 9 o’clock Thursday morning. Firefighters say all the utilities in the building are off, and that’s an indication that the fire was intentionally set. When firefighters arrived at the building on East Center Street they saw smoke coming from the second and third floor windows. They put the fire out in about 15 minutes. If this fire is determined to be arson it would be the third in Elk County this month. The first two were house fires.  MOWING – Various Routes, Kane & Bradford area. NEWPORT NEWS, Va. – Just like they've done throughout their careers as student-athletes, Justine Raterman and Manuela Marin Salcedo have another chance to represent the Atlantic 10 Conference among the NCAA's elite. The A-10 announced Thursday that Raterman, a Dayton women's basketball standout, and Salcedo, a St. Bonaventure women's tennis student-athlete, will be the Atlantic 10 Conference nominees for the NCAA Woman of the Year award. The pair will join nominees from member institutions from all three NCAA divisions. The NCAA Woman of the Year Award honors graduating student-athletes who have distinguished themselves throughout their collegiate careers in the areas of academic achievement, athletics excellence, service and leadership. An 18-year-old from Hinsdale is charged with burglary for an alleged incident that happened during Memorial Day weekend. John Fratarcangelo is accused of breaking into a house on Route 16 in the Town of Hinsdale and stealing more than $1,000 worth of items. Sheriff’s deputies did not provide additional information about the grand larceny. He was released on his own recognizance and is scheduled to appear in Town of Hinsdale Court on July 18. Two men and a woman are accused of having bath salts in Roulette on Wednesday afternoon. State police say agents from the state parole board asked them to go to 48 River Street, where they found 21-year-old Kimberly Bisher and 19-year-old Gabriel Weinberg, both of Roulette, and 22-year-old Robert Hamilton II of Port Allegany with suspected bath salts and drug paraphernalia. Hamilton was taken to Potter County Jail on a parole violation. Weinberg was taken into custody by the McKean County Probation Department. Bisher was taken by ambulance to Charles Cole Memorial Hospital. Hamilton is charged with felony count of possession with intent to deliver a controlled substance. He and the others are also charged with misdemeanor drug law violations. Hamilton is in Potter County Jail on $20,000 bail. A Jamestown man already jailed on 2 counts of first degree manslaughter is accused of assaulting another inmate in the Chautauqua County Jail. 41-year-old Gregory Pattison allegedly hit the other person, causing facial injuries and bruising on his head and face. He is charged with assault and will appear in Town of Chautauqua Court to answer the charge, according to Chautauqua County Sheriff's Deptuies. Pattison pleaded guilty June 20 to killing Richard Alicea Jr. and Johnny Houston back in 2001. He was convicted of murder back in 2005 but the conviction was overturned on a technicality. Pattison was hired by two drug dealers to kill Alicea, who was an informant for the Southern Tier Regional Drug Task Force and took more than $150,000 worth of drugs from them. The drug dealers, Aaron Pike and Daniel Diaz were convicted for their roles in the murders and are still in prison. About 2,800 Bradford-area Penelec customers are still without power after a tree fell near a substation on Route 770 at about 8 o’clock this morning. Penelec’s Linda Routzhan says the outage affected about 5,000 customers, but crews were able to restore power to some of them. She said crews were able to isolate the area affected by the fallen tree, and are working to fix the lines and restore the rest of the power. She said there’s not estimate on when all power will be restored, but crews will be working until all customers have power. Yes, I know St. Bonaventure in Allegany but ... Oh, that's beside the point. The Orlando Magic chose St. Bonaventure's Andrew Nicholson with the 19th pick in the 2012 NBA Draft. How 'bout from Ontario to Orlando? HARRISBURG – State Rep. Matt Gabler (R-Clearfield Elk) voted Thursday to support the proposed state budget, which now faces a final vote in the state Senate. The bill, which passed with a bipartisan vote of 120-81, proposes $27.7 billion in total General Fund spending for Fiscal Year 2012-13. It contains no tax increases and returns spending to 2008-09 pre-stimulus levels, with growth that is less than the rate of inflation. Students in the “Healthy Cooking” course sponsored by the University of Pittsburgh at Bradford a prepared delicious yet nutritious meal. The course was taught by Bradford Area High School’s family and consumer science teacher, Kimberly Preston. Class was in session from 9 a.m. to 1 p.m. on June 27 in the BAHS Home Economics Lab. These courses are part of a series of summer classes designed to promote healthy living. 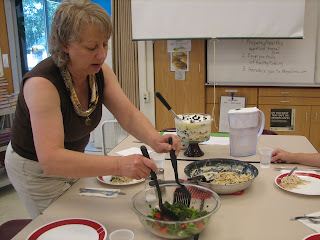 Students Renae Lucks and Connie Upton prepared a healthier alternative to chicken alfredo. Their version of the recipe used chicken broth, flour and fat-free cream cheese instead of the traditional butter and milk. They also added less parmesan cheese and used whole wheat pasta. These simple changes slashed 310 calories and 30 grams of fat from each serving of the dish. HARRISBURG – In the face of continued economic challenges, the state House adopted a $27.7 billion budget for the 2012-13 fiscal year that funds key services such as education and health care without increasing taxes, said Rep. Martin Causer (R-Turtlepoint). Under the prior administration, state spending increased substantially due in large part to the short-term federal stimulus funding. When that money dried up last year, it left the Commonwealth facing a multi-billion dollar shortfall. Andrew Nicholson will not be at the NBA Draft, but www.GoBonnies.com will have comprehensive coverage from both inside Nicholson's private Toronto gathering and the NBA Draft at the Prudential Center. Beginning at 6:45 p.m., a special pre-show live from Nicholson's gathering with host Shannon Shepherd will air on UStream at http://www.ustream.tv/channel/nicholsontest. Shepherd will interview Nicholson, in addition to other former teammates and coaches expected to be in attendance. The show will be archived and available to watch following the Draft. Following Nicholson being selected, go to www.GoBonnies.com for complete reaction, including videos, a Twitter recap and the traditional release. The Department of Environmental Protection will hold a public meeting on Wednesday, July 11, to discuss the Daguscahonda public water system in Ridgway Township, Elk County, and the steps necessary to comply with the Pennsylvania Safe Drinking Water Act and its regulations. The informational meeting will be held from 6 to 8 p.m. at the Ridgway Township building at 164 Ridgway Drive. The U.S. Congress adopted the Safe Drinking Water Act in 1974 and directed the U.S. Environmental Protection Agency to enforce the law, which established standards governing public water systems. A blue-day sky with a light breeze drifting through the treetops deep within the Allegheny National Forest was the picture perfect setting for the trail dedication of the newly constructed Bullis Hollow Trail that took place at 10 a.m. today. Forest Supervisor Erin Connelly opened the dedication by highlighting the important numbers associated with this trail-2.5, 8.3 and 305. Volunteers from the Tuna Valley Trail Association first approached the Allegheny National Forest (ANF) with an idea for a new trail that would connect the Tracy Ridge Trail System to the Marilla Trail System located just west of the City of Bradford -2.5 years ago. Working together through the summer season of 2011, Tuna Valley Trail volunteers and ANF personnel completed on the ground final trail layout along with archaeological and biological surveys. Environmental assessment work was completed by Allegheny National Forest personnel in the fall of 2011 and trail construction was just completed in May 2012. Harrisburg – State and local police, along with PennDOT, will take part in a national enforcement effort through July 8 targeting motorists who drive under the influence. The “Drive Sober or Get Pulled Over” enforcement effort will focus on keeping Pennsylvania’s roads safe during the Independence Day travel period. Over last year’s Independence Day holiday travel period (July 1-4), there were 897 crashes and 14 fatalities. Of those, according to PennDOT, 146 crashes and six fatalities were alcohol-related. Albany, NY -- "Thanks to the leadership of President Obama and his administration, particularly Secretary Sebelius, the Affordable Care Act will provide access to health care to millions of Americans nationwide and more than one million New Yorkers, and I am pleased the Supreme Court upheld this law. We will continue to move forward with implementing the health exchange that will lower coverage costs for New York's businesses and help ensure that uninsured New Yorkers have access to health care. We look forward to continuing to work together with the Obama administration to ensure accessible, quality care for all New Yorkers." Harrisburg – Governor Tom Corbett today said he was disappointed in the U.S.Supreme Court ruling upholding the federal healthcare law, known as Obamacare, but said he will work hard to limit the law’s negative impact on Pennsylvanians. Corbett, when he was attorney general, joined a dozen other states in challenging the federal healthcare reform law. When he became governor, Corbett continued that court challenge, along with 26 other states. “It appears that the Supreme Court agreed with the lawsuit brought by myself and 12 other Attorneys General finding Obamacare unconstitutional under the Commerce Clause of the Constitution, however they did uphold the law under Congress’ taxing authority,’’ Corbett said. ST. MARYS – Work to improve Route 255 in Fox Township and St Marys is underway. The work zone stretches from the Route 948 intersection in Fox Township to the intersection for Tractor Supply. Once the project completes in late summer 2013, travel along this section of Route 255 will be smoother and more efficient. PennDOT will issue regular updates on this project. Activity the week of July 2 will include work from approximately Greenbriar Drive (T-593) to the intersection at Tractor Supply. • Changing traffic patterns: The contractor will continue patching the existing concrete pavement at various locations. One lane northbound and one lane southbound will be closed to perform the work. One lane in each direction will remain open to traffic at all times. • The contractor will place a bituminous leveling course over the existing concrete pavement. • The contractor will be removing existing guide rail and begin benching existing slopes and placing rock armor. The Community Blood Bank is expecting next week to be one of the worst weeks of the year for the local blood supply. The July 4 holiday falling on a Wednesday means instead of dealing with just a long weekend, there is a 9-day period of heavy use combined with much lighter donor turnout. People can help stock the blood bank before the holiday week by donating today in the BRMC outpatient lab in Union Square. The blood bank is open from 3:30 to 7:30 today, and again on Saturday from 9 a.m. to 1 p.m.
Ormsby – Motorists traveling along Route 59 in Keating Township, McKean County, near the village of Ormsby will be reminded of one of the most common types of aggressive driving behavior: speeding. PennDOT recently placed a radar-controlled speed display sign in a 55-mile-per-hour zone along westbound Route 59 at the request of Keating Township. The speed display sign uses radar to determine the speeds of oncoming traffic. Vehicle speeds are then posted on the lighted section of the sign. 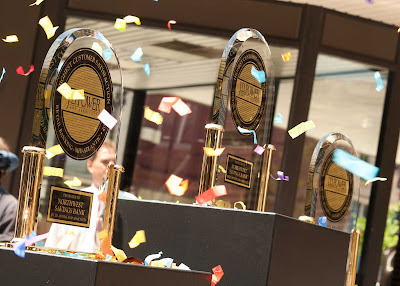 A group of more than 700 employees of Northwest Savings Bank cheered at the unveiling of the 2012 JD Power and Associates Trophy for Highest Customer Satisfaction with Retail Banking in the Mid-Atlantic Region at a company celebration and picnic in the streets of the bank’s headquarters town of Warren, Pennsylvania today. This is the third consecutive year that Northwest Savings Bank has received the award. OMAHA, NEB – St. Bonaventure men’s swimmer, sophomore James Martin will compete today in the 100m Freestyle event at the United States Olympic Swimming Trials. The NBC Sports Network will have full coverage of the semifinals at 4:30 p.m. ET followed by coverage of the finals on NBC at 8:00 p.m. ET. 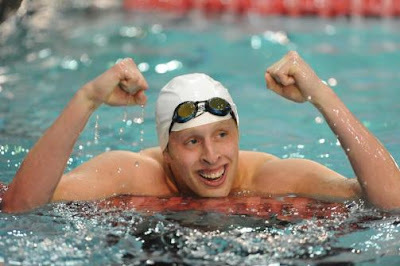 Martin qualified for the Olympic trials at Flickinger Aquatic Center in Buffalo, N.Y. during an event hosted by the USA Swimming Speedo Champions Series in late March. Martin qualified in the 100-meter freestyle when he touched in at 51.39, coming in .10 below the standard time of 51.49. At the A-10 Championships, Martin sprinted to a gold medal time of 44.82 in the same event.